I don’t often make time just for myself or make may purchases for myself, like most mums you tend to your children and family first. It’s very rare that I treat myself, or enjoy time alone that isn’t spent working and I honestly don’t have any problems with that but sometimes it would be nice to be able to treat myself. One thing that I would like to treat myself to is a nice watch, I’ve never really been a watch person, in fact the last time I can remember wearing a watch was a Baby-G watch in my teen years. I’m now older and beginning to appreciate watches, perhaps it’s my age but I seem to be drawn to them. Whilst cruising through duty free waiting for our flight to depart I spent a long time admiring the selection of watches available trying to narrow down what I would like in a watch. I honestly didn’t know there were so many options available to me. First of all I knew that I wanted a watch that would be suitable for all occasions, whether I was traipsing around a garden centre, running around soft play or even attending a wedding reception so this ruled out a leather strap for me. It needed to be water-resistant, I’m forever cleaning and tidying so I need the piece of mind that if I accidently forget to remove the watch that I’m not going to ruin it. I have quite large wrists for a lady so I wanted a round face to not draw attention or make them look even bigger. I wanted the watch to be worn with most of my jewellery pieces so it would have to be of a similar colour. 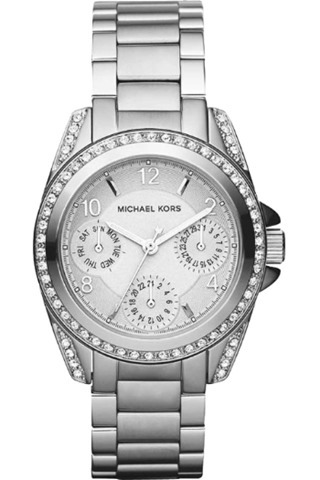 I had finally settled on the style of watch that I would like in my life, then I saw it, the Michael Kors Ladies Blair watch. It ticked all of my boxes and for the first time in my life I was lusting after a watch. It was the perfect combination of classical and elegant with its paved crystal insets and stainless steel bracelet strap. You can see more about the watch here on the Watch Hut site. I’ve added it to my Christmas list this year but I actually think that I might go a little crazy and purchase this as a special treat for myself.